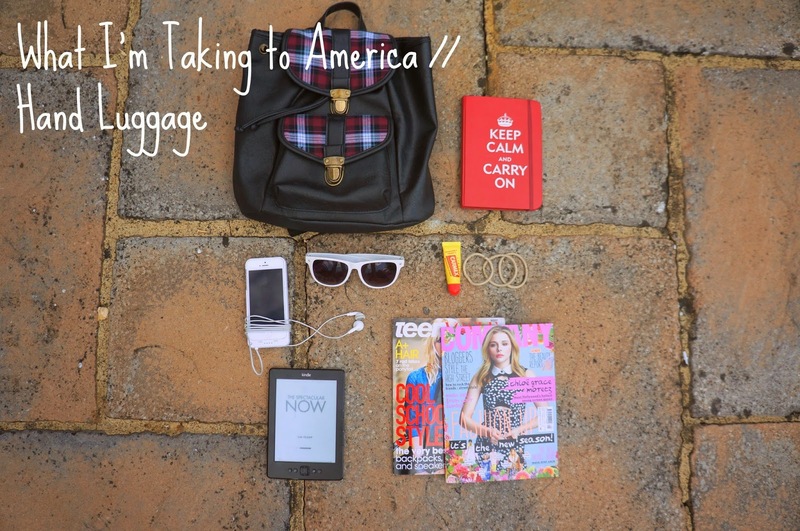 Over the next couple of days I'm going to be doing a mini-series where I'm showing what I'm taking to America! Now I go this week but I haven't started packing yet but thought to start off with I'd show you what I'll be taking in my hand luggage, as its an 8 hour flight, I'll need some entertainment! Although I did see that Divergent is on the tv so that's a plus. Bag // A standard backpack that is going to be super handy on the long sightseeing days in Chicago. Journal // I love documenting what I'm feeling or any idea's I have in here. Magazines // A must have on any flight. Kindle // I need to update my reading list but my kindle and reading will be a major part of my holiday. Sunglasses // For stepping out into the sunny Chicago skies. Hair Ties // Always a must when I need to throw my hair into a top knot on the plane. Carmex // I hate the dryness that comes with flying so this will most definitely be needed. Headphones // I don't think I could handle my holiday - mostly my flight and sunbathing - without headphones. Iphone Charger Case // Allows my phone to have double battery life which is great as the Iphone battery life is so rubbish and it would be dead after an hour of the flight! Iphone // Because I just cannot seem to go anywhere with it. Hope you enjoyed this small sneak peak into my packing, keep an eye out for more over the next couple of days!